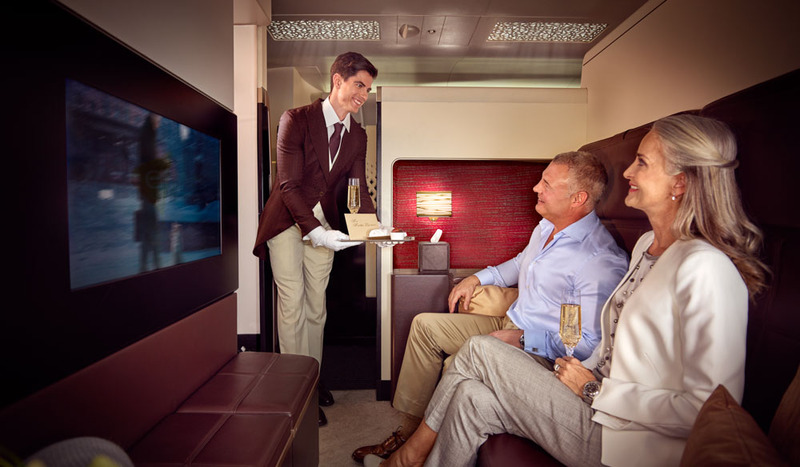 Sit back, relax and enjoy the butler service offered onboard Etihad. Enjoy a turn-down service and breakfast in bed, all in the privacy of your own quarters. Who hasn’t always wanted to fly on a private jet? It’s the domain of movie stars and presidents, but Etihad Airways’ three-room suite on-board their A380s, which you have entirely to yourself, offers a private jet experience within a commercial plane. It’s called The Residence, and it’s the top-end flight experience at Etihad – going beyond the first class experience of any other airline. It goes like this: over almost 12 square metres, you have three rooms. There is a lounge room, equipped with a 32-inch television and a long, leather sofa (designed by Poltrona Frau), so you can cosy-up and watch a movie as if you were at home. It’s here that you will enjoy meals served by your own butler – trained at The Savoy Hotel in London no less – who will serve your meal as per your instructions pre-flight. Chef can make you delicious dishes from a larder of fresh ingredients on the plane too, so all you need do is ask if you’d like anything extra; it’s all part of the service. Meals are served on 24-karat gold-plated porcelain tableware, designed by Bernardaud in France, and eaten with Studio William cutlery, also inlaid with 24-karat gold (because a girl can never have too much gold…). Even your glassware has been designed by a superstar ­– it’s Vera Wang for Wedgwood. After you’ve finished, you can enjoy The Residence’s Cognac service in elegant Norman of Copenhagen glassware. Sharing a bathroom with a myriad of other passengers is not your concern, because you have your own private bathroom. Laze in your personal shower enjoying Acqua Di Parma products laid out for you (or freshen up with the Barbiere range of shaving products), pop on your bathrobe and wander down your private corridor to your own double bedroom. Here, you will probably forget you’re on a plane and not in a luxe hotel. The sheets are Egyptian cotton, the chic bedding is by Pratesi, and the double mattress is made from natural fibres so you’ll sleep easy and allergy-free. Need PJs? We thought so. Christian Lacroix has designed the Voyage range of loungewear, so you’ll stay comfy throughout the night. Even if you’re not tired yet, you can have that hotel experience of watching TV in bed (we’re not the only ones who love the guilty pleasure of late-night TV in hotel beds, are we? ), with a 27-inch LCD monitor in your room. Travelling as a couple? Ideal, because with a separate living room and bedroom, if one of you is tired before the other, you can have your own separate spaces until you’re both ready to hit the sack (that private mini bar in the living room might keep you up anyway, and why not? Your holiday has already started). And seeing as you’re on holiday, you may as well think of your butler as your concierge too, because he or she can actually organise your holiday while you’re on the plane. Need a restaurant booking? Done. Tickets to tomorrow night’s Broadway show? Just ask. Maybe you just need some advice on things to do – your butler is in touch with the world throughout your flight, and can arrange anything you need. 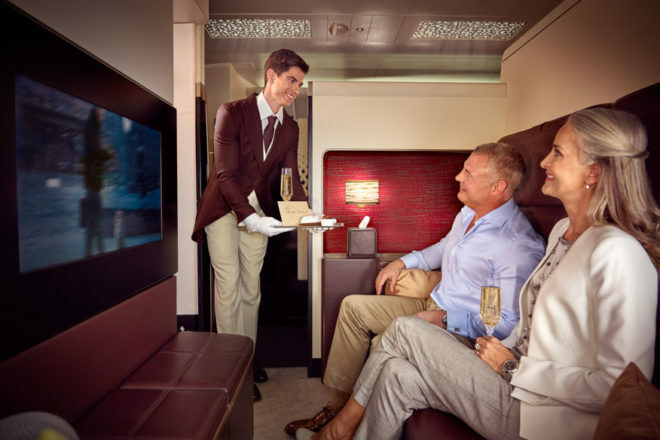 Plus, they are working directly with Etihad’s Lifestyle Concierge team and Ten Group, an international concierge service, so you’re talking to a real expert. Travelling solo? Why not try the First Apartment? The luxe barometer is still at boiling point with a separate armchair area and another for your six-foot bed. 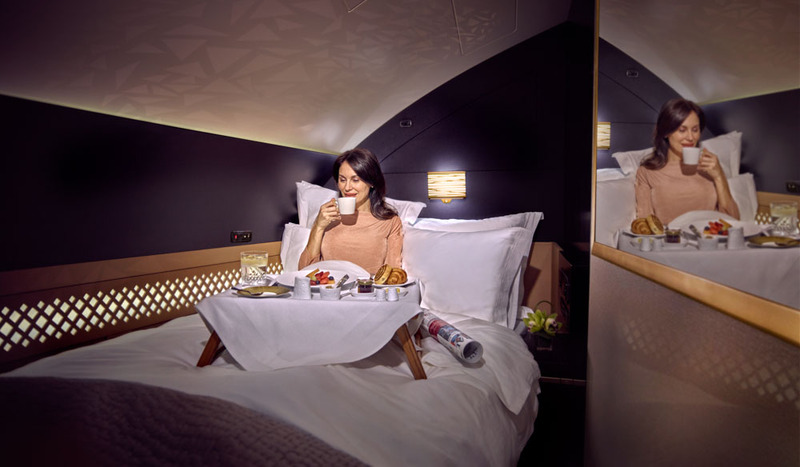 You still get to feast on delicious food at your leisure, experience Etihad’s celebrated turn-down service, and take a refreshing shower in the First Class bathroom. It was hard to think of travelling in a more opulent way than this on a commercial plane, until The Residence launched. The Residence is pretty much the most luxurious way to travel – outside of hiring a private jet – in 2017, so what are you waiting for? Start your holiday the moment you walk into the Etihad First Class lounge – it might end up being the best part of your trip. Two free tickets and I will guarantee an absolutely first class ( plus 1 ) review.